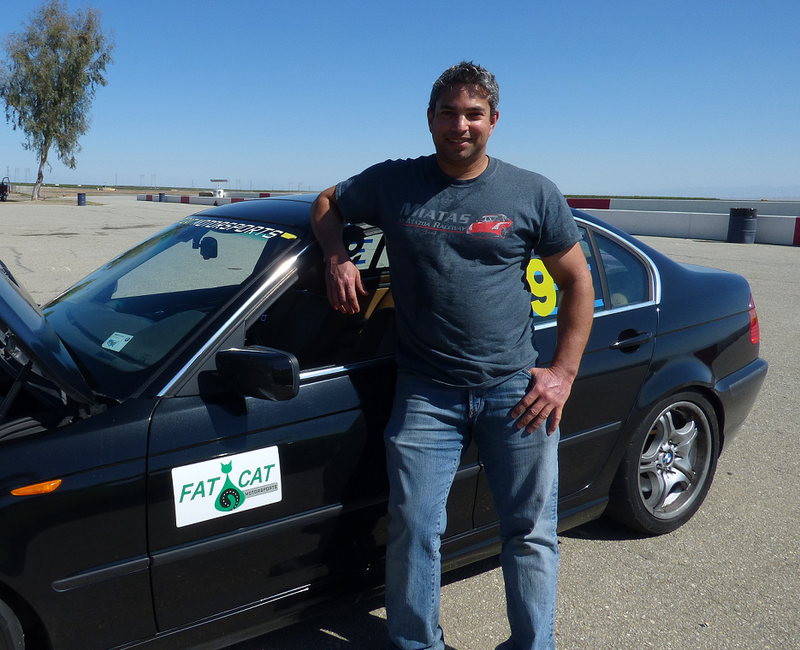 My first trip to Buttonwillow Raceway Park and dancing with anxiety – The Perfect Ride by Fat Cat Motorsports, Inc.
I’ve heard of Buttonwillow for years and more recently watched various videos. People said it’s the premiere time attack track in California where top drivers and cars come to test their mettle. Perhaps because it was out in the middle of the central valley it seemed like driving on the moon. How far is it from the Bay Area? Wait, what – almost to LA?! As with watching people go around the Nurburgring, or over the mythical Corkscrew @ Laguna Seca (but Turn 6 is actually harder and faster), Buttonwillow felt intimidating. The hype and hoopla didn’t help. As with the first time I was on Laguna – even as a parade lap – I couldn’t imagine blasting through BW at speed, on the ragged edge… but man, I wanted to! So what would it be like to actually drive this track? Would I get embarrassed, get lost, go off, spin, hit something, or all the above in the first session (or lap)? The track has been smoothed out and repaved in many sections, so older videos may not reflect the current condition. I’d like to encourage anyone who has thought about running there to just GO! I can’t wait to return! Are you driving 13CW, or 1CW, or 13CCW, or 24CW or some other track setup? Be sure you know what configuration you’ll be driving. I was confused on this point until *after* the event! You’ll feel more relaxed having driven the track in your mind and followed along via Youtube. Plan to follow a more experienced driver for your first session, and I mean the whole session. See if someone is willing to stay near the back of the run group so you won’t have someone immediately breathing down your neck and get a couple laps to really feel out the track with someone who knows the line you can learn good habits from. This is the best way to make sure you’ll have the most fun and success throughout the day and on future visits. Pride here won’t serve you. I felt comfortable at Laguna and Thunderhill (I know I’ve got room to improve) but I openly asked for assistance at the driver’s meeting. It paid off. In terms of finding your way around whether or not you do a lead-follow, look for traffic cones at the apexes (they seem to have them there all the time) and potentially brake marker cones in some cases. Also note that generally there are minimal corner workers (unless perhaps it’s a race event) but keep them in mind. Fortunately you can see what’s going on ahead if you are indeed looking ahead. There are certainly some important nuances you need to be aware of to carry speed through various sections (not to mention staying on track where you really don’t want to go off) but I find it a very rhythmic road course. Sections flow into each other very well. In fact, I’d say I like it rhythm-wise more than Laguna Seca. Returning to the idea of looking ahead, that’s really important at Buttonwillow. If you’re patient and keep your vision up well over the hood of the car instead of focused at the next apex cone, you’ll find yourself feeling more relaxed and gaining speed rather easily. As a NASA instructor sagely pointed out, when you look up and farther out, the scenery moves more slowly and your body/mind have more time to plan for and respond to what’s coming up. Contrast this to the more nervous feeling you get looking at the fast-moving landscape right in front of the car which will make you more stressed and cause you to over-react. I can’t emphasize enough how important being RELAXED is when you’re on track. I know the fastest drivers often seem to be just barely in control and there’s a place for that – when you’re already familiar with the lay of the track and are gunning for that top lap time. I still believe and feel that you can be very fast without feeling panicked. A key point with Buttonwillow I found is that you’ll get dirt on track from other people’s offs and that will complicate your line choices. The corner worker, especially at Phil Hill is very helpful to let you know if there’s dirt on course (or a spun car) at that important, quite fast over-the-hill-and-down-the-valley turn. We had a bit of dirt at the apex of Phil Hill in the first afternoon session driving 13CCW (track reversed from the morning session). There’s an adage I learned from Andy Hollis’s Top 10 Autocross Tips – #1 Position first, then speed. I’ll combine that so say “Position and Vision first, then Speed.” Especially at higher speeds on a road course, you need to know where you’re going and until you go, you have no business trying to go fast. When you can see ahead, how the track is unfolding, the speed is naturally there. Preparation part 2 – Less is More, but don’t skimp on the important stuff! I’d already driven Laguna Seca twice this year before heading to Buttonwillow. I had debated about bringing the super sticky 275 BFG R1S that are sitting in tire bags waiting to be used but felt it was better to just get a sense of the course before trying to be a time attack hero. I’m very glad I listened to that intuition. It’s more important to show up with a setup you feel comfortable with than the fastest possible configuration that you don’t trust. That’s true for any track, but Buttonwillow can be deceptive as to where you can go fast and where you need to slow way down. For Socal peeps, I’d suggest running Streets of Willow before Buttonwillow, or Thunderhill first for Norcal folks. You’re doing things in reverse at Buttonwillow since the standard configurations there are clockwise (e.g. the ever-popular 13CW and longer 1CW) vs. counter-clockwise (CCW) at many other tracks. Of course configurations can vary but generally speaking, the 13CW or 1CW (which is what I ran in the morning) get you working the left-side tires harder than the right-side. I think Buttonwillow is an exceptional place to practice confidence in higher-speed turns turning both directions, as it seems afternoon sessions can run the opposite direction (which is what we did after lunch). That’s not something you get to experience at the majority of tracks I’ve run at. Definitely make sure your braking and cooling systems are fresh and track-ready. You also want reasonable tread on your tires. Especially if you’re driving down, don’t push your luck with an iffy cooling system as temps tend to be quite warm from Spring to Fall and certainly during summer. I have to give big thanks to Edge Motorworks in Mountain View and Tony Zwain in particular for his awesome advice and excellent care of our ’02 BMW 330i sedan. It’s because of the confidence I have in his track prep – Tony is a NASA road race and time attack National Champion plus has run and podium finished numerous 25 Hour of Thunderhill events – on the braking, cooling, and engine side that I am comfortable pushing the limits with our FCM Elite suspension providing the control, grip and confidence in the turns. Starting off slowly, have confidence in your machine, and working your way up to speed will ensure you can really appreciate this high speed and fun track without getting into avoidable trouble. I found a cool BMW E46 M3 driver, Ron, who has driven the track many times and offered to let me follow him the first session. It was certainly helpful to see his lines even though we ended up getting separated, but you can watch the first few minutes of the video above to get a sense of a good line. Got caught in traffic later in the session but definitely enjoyed myself. Session 2 – feeling more confident and enjoying some tunes! I was playing with mic placement for our new GoPro Hero4. For this track day, I had an external mic from Saramonic SR-GMX1 Lavalier clip-on positioned under the dash per a recommendation from another track enthusiast. I could do a bit more wind baffling to reduce noise, but the music sounds reasonably good off the car’s speakers. I was really feeling the juice a couple laps in and had some nice open sections as well. Later in the session I got to play with a track-prepped Miata and an Audi sedan that was moving pretty good. Over the sessions I got more and more comfortable and really felt the flow and magic of the track. It’s a very cool place, and there’s a lot of room to run. I think having it be Clockwise vs. Thunderhill and Laguna counter-clockwise helps even out tire wear! There’s my #2 reason to go there – #1 just because it’s awesome fun! I had my best lap of the day in the 3rd session, a 2:16.3. I sat out the 4th morning Session as the brakes were pulsing so I felt my day would be done pretty soon as I hadn’t planned to change brakes at the track. I wanted to do at least one session in the 13CCW configuration. Plus I’d had nearly 1.5 hours on track so it was a full ‘day’ already! In the first session after lunch, I did 13CCW with a passenger – Christina, shooting for Cali Photography. It was her first time on track and she was very calm. I was glad to introduce to her to the world of high performance driving though she’d been on fast motorcycles before. Pressure can motivate us but taken too far it can cripple. Let pressure provide useful (but not crazy) motivation to prepare yourself physically, mentally, and spiritually for what you want to accomplish. Worrying doesn’t accomplish anything except making it less likely you’ll have fun or be successful at what you’re doing. While on track, I sometimes have to remind myself to breath, deeply and rhythmically. That certainly calms your system down and also puts you in a receptive space where your heart is driving your heart, instead of vice versa. Joy, passion, excitement, and contentment are different parts of the heart spectrum but all empower us to achieve our goals and communicate deeply with each other. In some ways, autocross is actually much more intense, much more active IMO than HPDE driving (but certainly not as intense as actual wheel to wheel racing). I learned in those early days of autocross that I had a tendency to hold my breath during a run. That was counter-productive to achieving ultimate speed but getting over that habit can be challenging. I used my time on course or on track as a meditation to improve all areas of life, being able to relax, be present with what is and roll with the punches. The weekend after the track day at Buttonwillow, I attended a workshop run by David Deida. We had various exercises that emphasized dropping into your lower body (not your mind!) and connecting to your partner. I will be writing more about this topic, but being on a race track isn’t a you vs. the track situation. It’s you *and your vehicle* wanting to integrate and dance as fluidly as possible. Even if you are feeling stress and anxiety, or you feel that from your partner, keep moving, stay engaged. By staying centered, breathing rhythmically and deeply, and enjoying the movement – savoring the great gift it is to be ALIVE! – you’ll get the most from all your relationships. Previous Calling all Tesla Roadster Owners! Next Another FCM Elite Client Success Story – Rajat A.